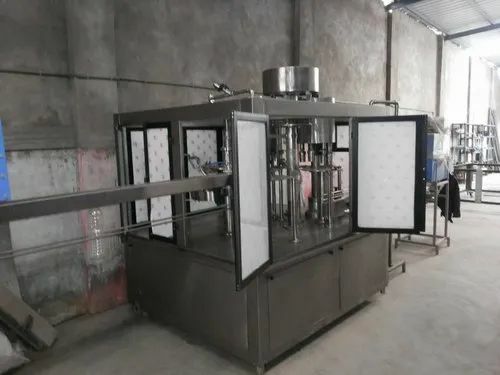 To meet the diversified requirements of our prestigious clients, we are engaged in offering Automatic Beverage Bottling Machinery Juice PET Bottling Mac. This machine is utilized for washing, filling and sealing juice into the pouches and bottles. Also, minerals water filling can be added feature for the clients. The offered plant cleans and denaturalizes chemicals, salt, bacteria and other fungal effects from the fruit and extracts real juice and fill into the bottles or pouches. The machine is mainly used in the beverage and drinking filling operations. The three functions of bottle washing, filling and capping are composed of one body of the machine. The whole process is automatic. The machine is used to fill bottles made of polyester and plastics. The machine is conveniently turned to adjust the machine to fill various types of bottles. The filling operation is faster and more stable due to the micro-negative pressure filling operation of the new type is adopted. The output and benefit of the machine are higher than the machines of the same specifications. We, Shreeji Projects, established our presence in 2013 as the manufacturer, supplier and exporter of a wide gamut of Filling and Packaging Machinery. Our offered range is inclusive of PET Bottling Machines, Glass Bottling Machines and Mineral Water Rinsing Filling Capping Machines. Our offerings are designed using innovative technology and enable high operational efficiency for the customers. These machines are easy to operate, power efficient and require minimal maintenance, making them highly appreciated by the customers. As a result, we have been able to establish a strong foothold in the industry within a limited period of our existence. Our clientele is spread across multiple locations across the world and we strive hard to cater to the diverse needs of each market. Since our establishment, we have maintained a customer-centric approach and have taken several measures to understand and fulfill the diverse needs of the customers. Our professionals design the machines keeping in mind the customers’ requirements and fulfill these requirements in the most cost-effective manner. We offer favorable business terms to the customers to enable for them a delightful experience of transacting with us.